More research needs to be done to highlight the long-term effects of marijuana use on the brain, body and our behavior, experts say. As marijuana legalization builds momentum across the United States — with Michigan becoming the latest state to allow recreational use by adults — researchers are warning that more studies are needed on the long-term effects of chronic pot smoking on the human brain. Marijuana is the most commonly used illicit drug in the United States, but little is known about its effect on health or how addictive it is. According to a 2017 poll conducted by Marist College and Yahoo News, more than half of American adults have tried marijuana at least once in their lives, and nearly 55 million of them, or 22 percent, say they use it currently. Close to 35 million are what the survey calls "regular users," people who say they use marijuana at least once or twice a month. 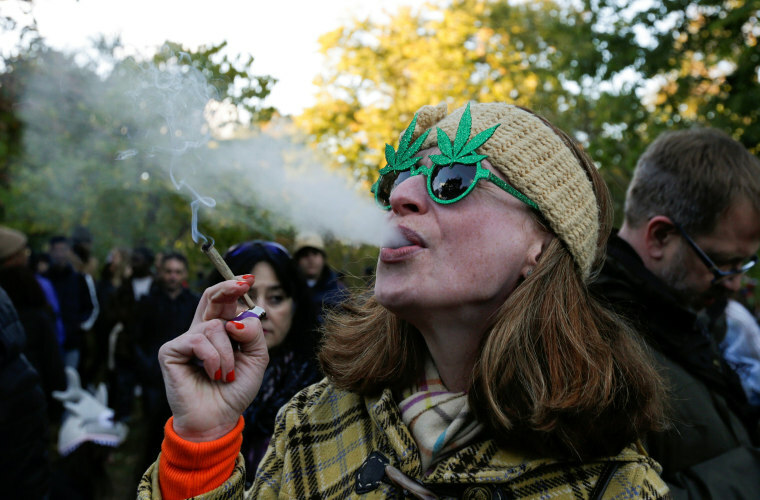 "Surprisingly, many people freely admit to using marijuana, but underreporting remains an issue," said Jonathan Caulkins, a drug policy researcher and professor at Carnegie Mellon University. "To correct for that one should fudge upwards by a factor of 20 to 40 percent." With Michigan's Election Day ballot measure, 10 states and the District of Columbia now allow the drug's open use; 33 states plus D.C. allow medical use, leaving many to wonder if the U.S. will follow Canada's lead in legalizing marijuana nationwide. Nathaniel Warner, 31, a data analyst at the Mayo Clinic in Rochester, Minnesota, first tried marijuana when he was 19, during his freshman year of college. Warner was having a hard time adjusting to campus life at St. Olaf College in Northfield, Minnesota. “It was a tough transition for me and I was dealing with social anxiety,” Warner told NBC News. After four years of heavy use, Warner noticed that his short-term memory was starting to fray. He avoided talking to people, and festering feelings of anxiety and depression grew. He tried to mask them with weed, deepening his dependency. In 2010 Warner upended his life, breaking up with his girlfriend and seeking recovery. “I was hopeless. I realized that this lifestyle of being miserable and getting high was never going to change. I didn’t want to go through a 30- to 40-year cycle of going to work and coming home and getting high. I didn’t see an escape from that. That kind of shook me,” Warner said. Unfortunately, Warner’s story is not uncommon. While alcohol is more dangerous in terms of acute overdose risk, and also in terms of promoting violence and chronic organ failure, "marijuana — at least as now used in the United States — creates higher rates of behavioral problems, including dependence, among all its users,” said Caulkins. The research leans towards yes. Studies have shown that chronic marijuana use affects the same brain structures that are involved with addiction. Marijuana use disorders are often associated with dependence — in which a person feels withdrawal symptoms when not taking the drug. Frequent users report irritability, mood and sleep difficulties, decreased appetite, cravings, restlessness and physical discomfort that peak within the first week after quitting and last up to two weeks. Marijuana dependence occurs when the brain adapts to large amounts of the drug, requiring more and more to create the desired euphoric effect. Marijuana use disorder becomes addiction when the smoker cannot stop using the drug even though it interferes with many aspects of his or her life. Estimates of the number of people addicted to marijuana are controversial, in part because studies of substance use often use dependence as a measure of addiction even though it is possible to be dependent without being addicted. In Warner's case, he developed both a dependence and an addiction. The first time he seriously decided to quit he gave his stash to his girlfriend to keep it away from him. Later that day, he came home and sweet-talked her into giving it back. Choosing relationships and activities based on whether you will be able to get high. Researchers estimate that 4 million people in the United States met the criteria for marijuana use disorder in 2015, but only 138,000 of them voluntarily sought treatment. How bad is chronic marijuana use? Most experts agree that more research needs to be done to accurately answer this question. First, there is no universal definition of what constitutes "chronic" use. A Canadian study published in the Journal of Child Psychology and Psychiatry in 2017 showed a substantial increase in “psychotic-like experiences” in teenage users. The study also reported adverse effects on cognitive development and increased symptoms of depression. Other studies show that chronic use may even interfere with normal development of the adolescent brain. Patricia Conrad, professor of psychiatry at the University of Montreal, believes that more research needs to be done to see the effects of chronic marijuana use on the brain. “Potency has increased over time,” said Conrad. "More sophisticated technology is being used to extract CBD oil from the product, resulting in more and more products with potent levels,” said Conrad. One study that received a tremendous amount of publicity looked at 38,600 samples of cannabis confiscated from 1995 to 2014. Analysis of these samples found that the average amount of THC, the psychoactive portion of the drug, rose from 4 percent in 1995 to over 12 percent in 2014. During that same time, cannabidiol, the non-psychoactive component of marijuana, fell from 0.28 percent to 0.15 percent. This shift in the ratio of THC to CBD has a pronounced effect on the drug's perceived potency. The average potency of the flower product sold in Washington’s state-licensed markets is over 20 percent, and the average potency of extract-based products — like oils for vaping pens, dabs and the like — is in the neighborhood of 70 percent, said Caulkins. He believes more research needs to be done to see how this difference in potency affects the body, compared with the weaker product studied in the past. As more is learned about the the effects of marijuana on the brain and body, experts hope to figure out if marijuana is a drug that can be managed like alcohol or if it is a highly addictive drug that needs to be highly regulated, like tobacco. Warner has been sober since Oct. 17, 2010. He thanks his parents, the Mayo Clinic intensive addiction program and his 12-step recovery group for helping him to get back on track.